Fans familiar with the Blogtor Who fan site will know that its editor, Cameron K McEwan has a penchant for lists. Lists are great, we love a good list! So when we found out that Cameron was putting together The Big Book Of Lists, we were rather excited to say the least! First off, the title definitely lives up to its name - with over 255 pages jam-packed with facts, miscellany and trivia to test your own knowledge, you’re always going to find something new and informative about Doctor Who. For example, we were rather surprised to find out that the first time The Doctor strangled a companion was in The Twin Dilemma! :) Ever wondered exactly how tall each of the Doctor’s were? Or how many hours of screen time each Doctor had? Or perhaps how many times the word ‘Time’ has actually appeared in a title? Needless to say, this book has answers to all those questions and many, many more. The range of subjects, quotes and cross-referencing with other popular cult movies and TV shows is staggering, and is a testament to the sheer amount of effort and hard work, and love that has clearly gone into the book. Look out for a special list from Doctor Who composer, Murray Gold, where he shares his memories and thoughts from seven of Blogtor Who’s favourite ‘MuGo’ scores. As with Cameron's previous book (The Who’s Who Of Doctor Who) the content is supported by the beautiful artwork of Andrew Skilleter, and coupled with the striking pallete of colours and overall design of this title, it’s as visually appealing as it is factually. One of our favourite illustrations is the double-page montage (p38-p39) featuring all of the Doctors in a nod to the curator scene from the 50th anniversary special; The Day Of The Doctor. There’s also a rather snazzy ‘Percentage Of the Daleks’ infographic (p81) which shows the popularity of The Daleks by Doctor. They say good things come in three’s, so were very much looking forward to Cameron’s next offering, and if The Big Book Of Lists is anything to go by, it’s going to be a corker! 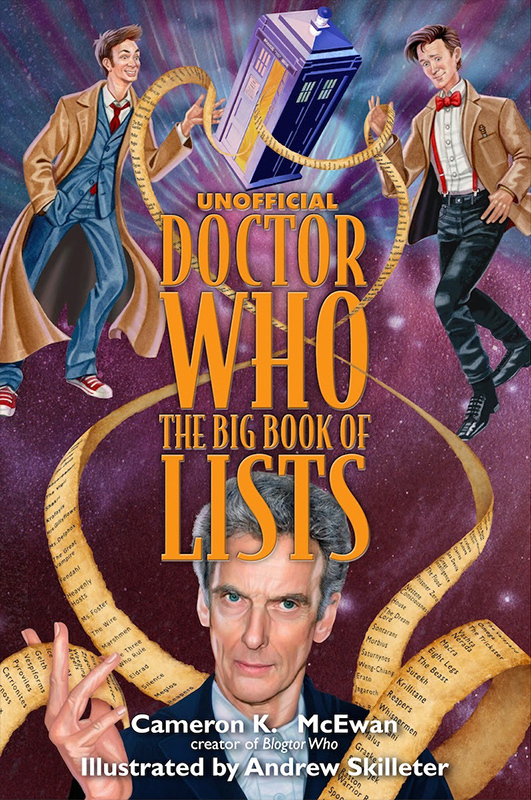 + The Big Book Of Lists is Out Now, priced £12.99 / $21.99 US / $23.99 CAD. + Buy this book on Amazon.co.uk for just £10.39.